We haven’t talked much about the incident that took place recently at a Eugene, Oregon school. There, a man was shot and killed by police after he drew an illegally carried firearm after being told to leave the school. Earlier this week, police released body cam video showing that their officers didn’t just gun down some innocent man but instead responded to provocation in the form of a bad person drawing their weapon on school property. Now, it seems the deceased’s friends are a little upset and are trying to get even. Police in Eugene are searching for answers after explosives were found outside their headquarters on Country Club Road late Monday afternoon. Lt. David Natt said incendiary devices were discovered by a crew who was mowing the front lawn. The Eugene Metro Explosive Disposal Unit was called and defused the explosives. Natt would not go into details about the devices but said they are now in the hands of forensic experts. “Our hope is that we get some physical evidence off it and that physical evidence leads us to somebody involved in the production and/or deployment of these devices,” Natt said. While the Eugene Police Department is in charge of the investigation, Natt said they have reached out to federal agencies and plan to review security camera footage. The police are also reaching out to others in the area who may have some footage. But seriously, who would do something like this? The radical Landeros, wearing a “Smash the Patriarchy” t-shirt and carrying a concealed firearm showed up at his daughter’s school. In addition to an illegally carried pistol, he also toted a backpack full of loaded magazines. When police intervened, he drew the pistol and fired two rounds. This represents a dangerous escalation in Antifa’s tactics. 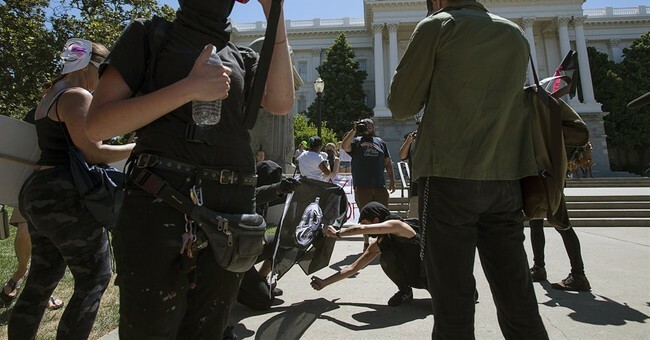 Before this, Antifa was content with mostly property damage, though the group has also been implicated in plenty of cases of assault, some rather nasty. Before now, it hasn’t done much in the bomb-making arena. While these didn’t go off, they were reportedly real devices that could have killed a lot of people. That was Antifa’s intent. All because one of its members was shot and killed rather than allowing him to murder a police officer. That tells you a lot about the group’s mentality. Antifa likes to pretend it stands against fascism, but it’s the ones who are more than willing to use violence to enforce its political will. There’s no reason to believe we won’t see more of this in the future.